An artist’s impression of the €30 million, 500-bed St Vincent de Paul extension. Finance Minister Edward Scicluna said yesterday he had not approved a record government direct order of €274 million and admitted he had only become aware of it through a story in The Sunday Times of Malta. 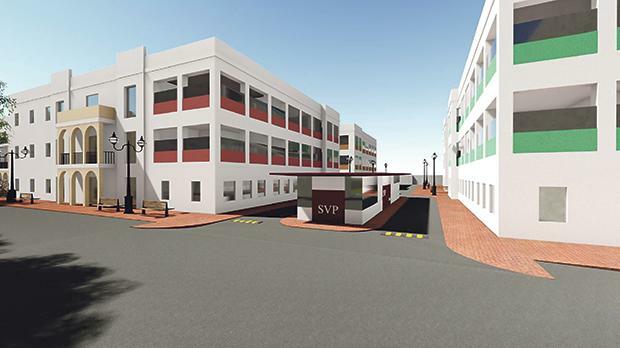 The newspaper reported that a joint venture between James Caterers and Malta Healthcare, a subsidiary of the Seabank db Group, was given a record order by the government to manage a still-to-be-built, 500-bed extension at St Vincent de Paul. No development permit has yet been approved for the building of the extension by the Planning Authority, but rather one to start excavations on the grounds at the back of the residential home for the elderly, which is owned by the government. A spokesman for Prof. Scicluna said on Monday “the minister had not approved any such direct order and had already requested a report on the matter from the Director of Contracts”. Finance Ministry sources said that such a direct order, a record in the history of direct orders, would have had to be approved by the Ministry of Finance. “This is not a direct order of a few thousand euros but one which is larger than the annual budget of many of the government’s ministries. It surely needs the approval of Prof. Scicluna and particularly his Permanent Secretary, Alfred Camilleri, and possibly even of the Cabinet,” the source said. “It seems that things are very unclear on the way this direct order was issued,” the sources added. Times of Malta is informed that the direct order has nothing to do with the Director of Contracts or his department but was issued directly by the Ministry for the Family, Children's Rights and Social Solidarity, headed by Michael Falzon. The direct order was approved last November and was associated with a different contract related to a private-public partnership for catering facilities and the building of a new kitchen at St Vincent de Paul won by the JCL and MHC consortium. Asked who approved the direct order, a spokeswoman for Dr Falzon did not reply. The Sunday Times of Malta reported that a contract, issued in 2015 and worth €58 million, was originally intended to procure a 10-year supply of meals for the residents and staff at St Vincent de Paul and the construction of a new kitchen. However, through an unorthodox clause in the tender asking for unspecified "additional investment" over and above the services requested in it, the contract was given to the JCL and MHC consortium, which despite offering a more expensive bid for the catering and kitchen service, promised to build a €30 million, 500-bed extension to the facility as a ‘gift’ under the additional investment clause. The tender specified that this additional investment was to become government property only at the end of the 10-year contract, which could be renewed by another five years. The tender did not say what would happen to the “additional investment gift” during the term of the contract. Asked repeatedly to give details of the contract, who was going to manage the new ‘gift’ facility during the contractual period and if the government would issue a new tender for the management of the new facility, the Ministry for the Family, Children’s Rights and Social Solidarity did not reply. The ministry also turned down a Freedom of Information request for a copy of the contract related to the tender. The Sunday Times of Malta reported that the government had approved a separate direct order giving James Caterers and the db Group subsidiary a mega direct order of €273,649,698 to manage the ‘gift’ facility that they would be building for the government if a permit was issued by the Planning Authority. Apart from the Finance Minister’s statement that he did not approve the direct order, no statements have been made by the government. The Democratic Party has asked for the publication of the full contract and warned that it may ask for an investigation by the National Audit Office.